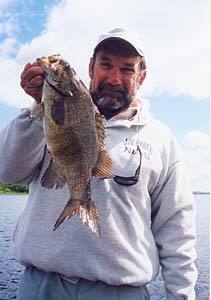 Russ has been a Wisconsin licensed muskie and bass guide for over 25 years. His guiding (Last Wilderness Guide Service) is focused on smallmouth bass in May and June with muskie becoming the center of attention from July into November. The muskie fishing is focused on the Vilas and Iron County areas and includes Lac Vieux Desert, the Cisco Chain, Crab Lake, Turtle Chain, Gile Flowage, Turtle Flambeau Flowage, Manitowish Chain, the waters of the Boulder Junction/Presque Isle area and others. An eight-hour day in the boat with Russ is $300.00 and covers one or two people. Be sure to bring your own rain gear, lunch, sunscreen, and a hat. Russ recommends also bringing a pair of polarized sunglasses, outside of the vision-saving benefits, it will help you see fish!